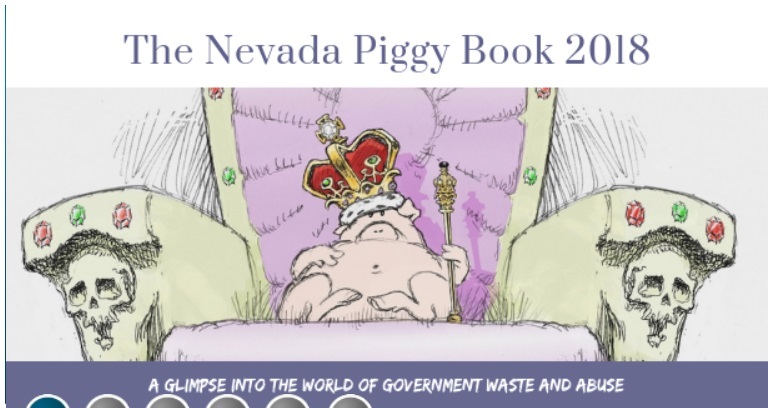 And at their recent annual dinner, Nevada Policy Research Institute (NPRI) had a copy of their latest edition of their “Piggy Book: A Glimpse into the World of Government Waste in Nevada” on our tables. Back in 2015, the Nevada Legislature approved a $75 million contract – paid for with a hike in your DMV fees – to upgrade the Department of Motor Vehicle’s computer system. And for some reason, the contract was awarded to a company based in…Mumbai, India. The company was eventually fired – but only after “roughly $17 million had already been spent with the firm.” So the DMV is still operating with the old system while you and I continue to pay the higher fees for the new, unusable system anyway. The Clark County School District – which has employed my opponent for the last 19 years – is, as Al Gore would put it, “a miserable failure.” Nevada continues to be ranked dead last in education. And because of that, NPRI reports in the Piggy Book, “the number of students transferring to charter schools has soared in recent years.” Charter schools are public schools that are given a lot more freedom in how they educate their students and without being saddled with the albatross of the teachers union around their necks. This exodus from failing public schools into successful charter schools means fewer students in the failing schools and, thus, less money for the failing schools (like my opponent’s). So what did CCSD do? Did they take steps to make their failing schools better? No. Alas, after the project was completed the U.S. Fish and Wildlife folks determined that “the newly-installed fencing did not meet federal requirements” because certain sections of the fence were only 8 inches off the ground instead of 24 inches. Exactly. And rest assured, while serving you in the Nevada Legislature I’ll be working closely with NPRI and other fiscally conservative organizations and individuals to fight wasteful spending rather than raise taxes. By the way, you can get more information on the absolutely great work NPRI does by visiting www.NPRI.org.